This is not me. * I am not in sweats with unbrushed teeth. I do not smell like gym socks. I am not still on the phone at 4:30PM. I am not the kind of mom that doesn’t dive head-first into helping with homework as soon as the kiddos walk through the door. I am definitely not still searching online for a recipe that uses the almost- too- old roast in my fridge. *photo taken at friend’s insistence. Happened to be the friend I was on the phone with. But it’s still not me. And tell Lisa her blog is a riot. She is real and I love it. Happy Monday! I am sure everything was accomplished that needed to be! I got lost in your blog today on the questions and answers. I really loved your family dinner time. You are a very sweet family. A Great Not Me! And you look pretty great to be so “icky”! I am not off to procrastinate further. Is it tomorrow yet? if you want to feel better about your day just stop in on my blog and read about my fun today. I kept saying “this is so NOT happening right now”, and well it was, and well it was disguisting. That’s how you look without make up and your teeth unbrushed? Gosh woman!! What is wrong with you.. you’re gorgeous.. Saw you on MckMama and had to stop in and read your Not Me’s. I loved them! LOL what a great post! I so get the “not me”. I often feel the “not me”. You are beautiful….inside and out! 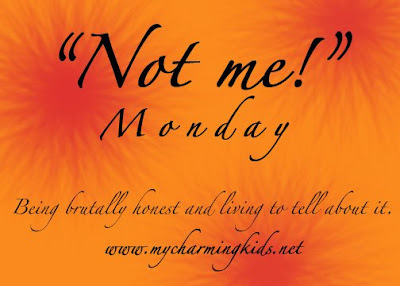 You must read about my “Manic Monday”!! Sometimes we just have to be HONEST!!!! Hey, do you want to join a mamarazzi blog? I’m looking for chicks who use DSLR cameras to be contributors with me. So far I think we have 5 or 6 ladies interested! The blog is http://www.wepicturethis.blogspot.com. I just set it up today. 🙂 Let me know if you’d like to be an author! Thanks for at least trying to make the rest of us feel better, though! Good to know I’m not the only one out there! I was in my p.j.’s yesterday until about 4:00 p.m. I follow blogs every morning with my coffee and everyone’s kids and houses always look so put together and “perfect.” I like it when someone comes clean and posts what life is really like some days! Thanks for being real Stephanie. Oh I am so glad that you are just like the rest of us!!!! BTW hough you are so pretty unshowered and un-teethbrushed.